First item of business: a huge thanks to painter, sound artist, and friend of the site Steve Roden for his write-up on Excavated Shellac in The Wire this week (found here). A generous gesture, and I appreciate it. And now, some music to greet your week with, and to play loudly. There are disagreements about the precise origins of polyphonic singing in Georgia, although many traditional Georgian choral songs actually date back to a “cult of the grapevine.” There are work songs, songs for festivals, and “table songs” – songs for singing around the table, so to speak: with food and wine. There are several types of polyphonic singing as well: complex polyphony from the Svaneti region in northwestern Georgia, three-part polyphony from western Georgia, and two-part polyphony over a bass drone, which is from Kakheti. They frequently take unconventional harmonic turns. Today’s piece, the Chakrulo, is a table song, and is from the Kakheti region, featuring two soloists (N. Togonidze and I. Mchediishvili) and the aforementioned bass, choral drone. 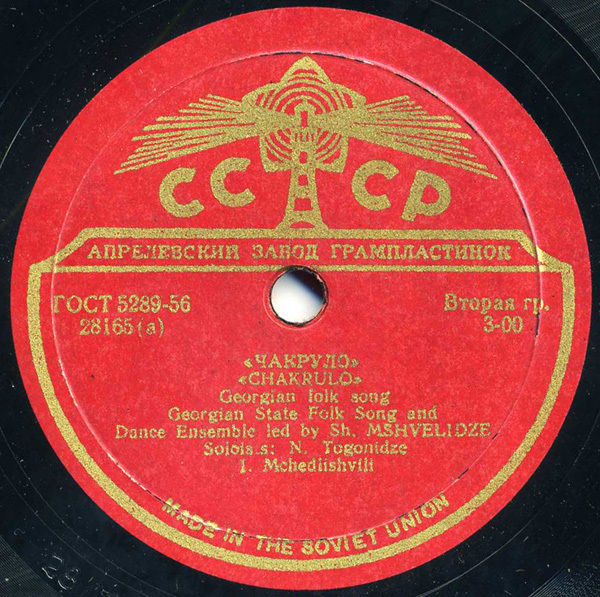 The recording was organized by Georgian composer Shalva Mshvelidze, who since 1930 had been traveling around Georgia recording folk music. This was most likely recorded in Kakheti ca. 1957, and supervised by Mshvelidze (rather than “led by” him, as the label states – that’s my guess, though I could be wrong). It is also worth bringing up the influence of the Soviet state on such recordings of folk music: it was everpresent. Perhaps with Georgian music, a little less (a sizeable portion of Georgian choral music is made of vowel syllables as opposed to words – less content to worry about! ), but certainly all aspects of religion were removed from most folk ensemble recordings. Then again, CCCP released recordings of choir music from the small town of Martvili (then known as Gegechkori), known for its ancient monastery, at around the same time. One thing is for certain, earlier Georgian choral music first recorded by the Gramophone company in the early part of the 20th century features voices that are incredibly raw – though the types of songs and styles are the same. By the same token, a 1988 recording of the Chakrulo by the Rustavi Folk Choir is exceptionally polished. I believe this piece, whatever influence the Soviet monolith had on it, is moving, and exceptional. The concept of “authenticity” is always tricky – when in doubt, lead with your ears. For early Georgian choral music, we are lucky to have the CD Drinking Horns and Gramophones, released on the Traditional Crossroads label. Wow. Neat stuff. I’m trying to imagine a bunch of people sitting around a table singing like this–I’d love to be in the room. I like that Rustavi Choir CD just fine, polish and all, but this is outstanding. I want the b-side as well. hope ‘Drinking Horns and Gramophones’ is at least as good as this. So 21865 implies it was released in 1952. 1957 is correct – thank you! Hadn’t gotten around to adding the correct year. Flip side is “Zamtari” (Winter) by the same group.